These two images here were taken at the same time on two different cameras. 1. 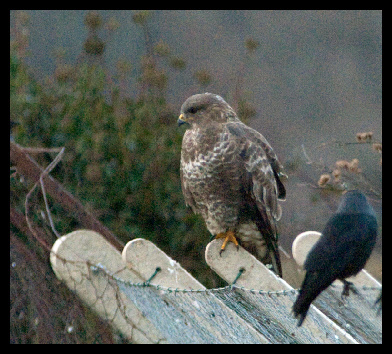 The left image is on the Nikon D2xs with a Nikon 300mm prime and 1.7TC (800 ISO, 1/320s F5.6). It contains a high level of noise in both of the birds especially the black feathers on the rook. .
2. The right image is on the Nikon D3s with a Nikon 500mm prime and 1.4TC(2,500 ISO, 1/500 F6.3). There is significantly less noise and the camera settings are high enough to capture the bird in flight and give a good depth of field. The Nikon D3s will record short video clips at a resolution of 1280 x 720p which is a medium HD resolution. It is relatively easy to use, although a single button which be much more user friendly. You have to first click the LV (live view) button which is on the back of the camera, at this point any auto focus will cease, and you must focus using manual and use the screen as your guide (not an easy option). Then when you want to start recording click the FN button on the front of the camera. Best results are achieved when using a VR lens, as this will reduce camera movement. However even a non VR lens will produce good results if you start recording and leave for a few seconds to allow the camera to ‘settle’.The left video below is shot using a Nikon AFS 500mm prime with a Nikon 1.4 teleconverter at 2,000 ISO with no VR and the right hand at 1,200 ISO. The image quality and performance of this camera is amazing. It is solid, easy to use and probably one of the best upgrades to my Nikon kit for a while. I find that I am often using 2,000 ISO and rarely go below 1,000 ISO this enables me to use faster shutter speeds and obtain greater depth of field, something that was not possible with previous cameras. I was very impressed with the quality of the video footage, and found that 4gig sandisk III cards were very suitable for the application, and found no delays in record time. The only improvement I would have liked is a single button to record the video and no loss of autofocus. Maybe in the Nikon D3sx..............! Having recently purchased the Nikon D3s, I took it to a nearby reserve to see just how well it could perform and where it’s limitations lie. level and have less effect on wildlife. This works very well, when photographing an Oyster catcher from a hide when I used the Q mode it ignored me, but as soon as I changed to CH it flew away. The only disadvantage is that it shoots slower than the standard CH (continuous high) setting, if you are not too close you will still find the CH setting more suitable. I found that when taking flight shots, I preferred to revert to the CH mode with continuous focus. This is very fast, and even in continuous focus on birds in flight it performed better then my Nikon D2xs. It can be set to use different numbers of focus points, for wildlife I set it to 51. The day I visited the reserve the weather was very grey and dark (a typically February) with occasional rain. As I wanted to photograph birds in flight I set the ISO to 2000 (on my D2xs I rarely went above 400 ISO). I photographed a series of Bewick swans in flight using a 500mm Nikon prime and a 1.4tc. The shutter speed was 1/840 with an f stop of F10. The images were amazingly clean and you can see one of the pictures in the above slide show. 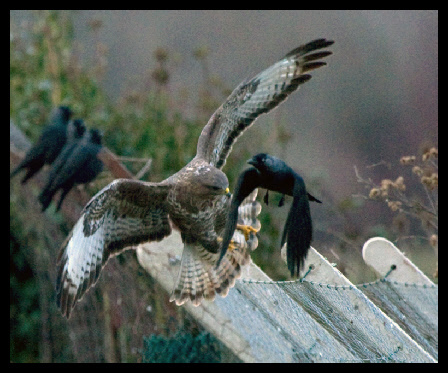 As the evening approached the Buzzard arrived, so I increased the ISO to 2,500 and reduced the shutter speed to 1/500 and the f stop to F6.3. The images do show some noise, but the pictures are usable, on previous cameras I would have long since packed up my gear and returned home.